Monday January 1st 1894 It is 22 years since I began to keep diary. I feel glad that I have done so. I was busy with my work all forenoon. I went over the river in the afternoon and with Mother & Hatt called at Mrs [Wodes?]. I came home at five oclock. About six Percy Bivens came in wet and chilled. He had been nearly drowned in rescuing a young man who had got through the ice. His Mother was with him. We soon got him comfortable and about eight oclock I went over to Dr brush \with Mary & Jennie to a social. Tuesday January 2nd 1894 Will helped me wash in the forenoon. I got dinner over early and went over the river in the afternoon. I spent the afternoon with Mother & Hattie. The evening I put in at home working on my mat. 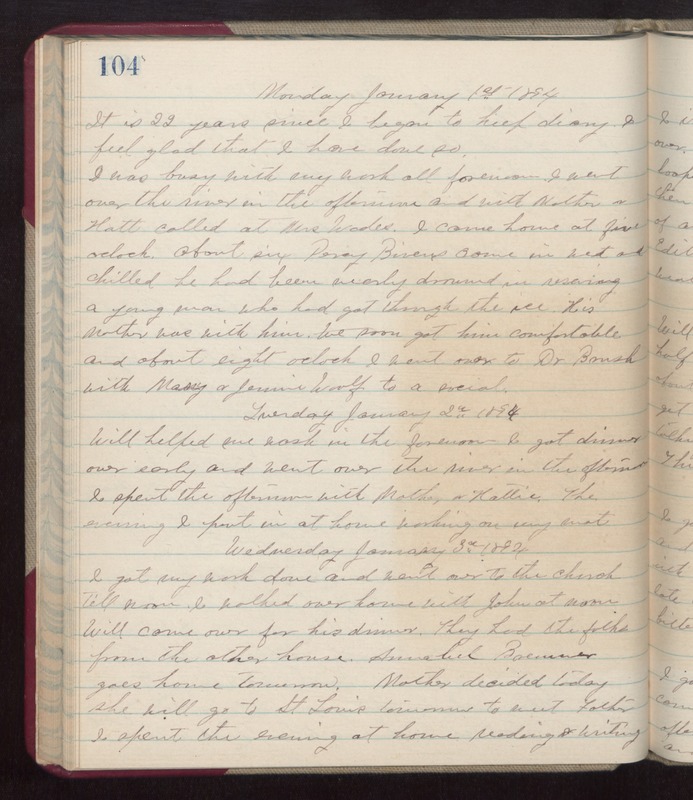 Wednesday January 3rd 1894 I got my work done and went over to the church till noon. I walked over home with John at noon. Will come over for this dinner. They had the folks from the other house. Annabel Bremner goes home tomorrow. Mother decided today she will go to St Louis tomorrow to meet Father. I spent the evening at home reading & writing.